Hi and Welcome to the AniModule SubForum at Muff's Modules and More. 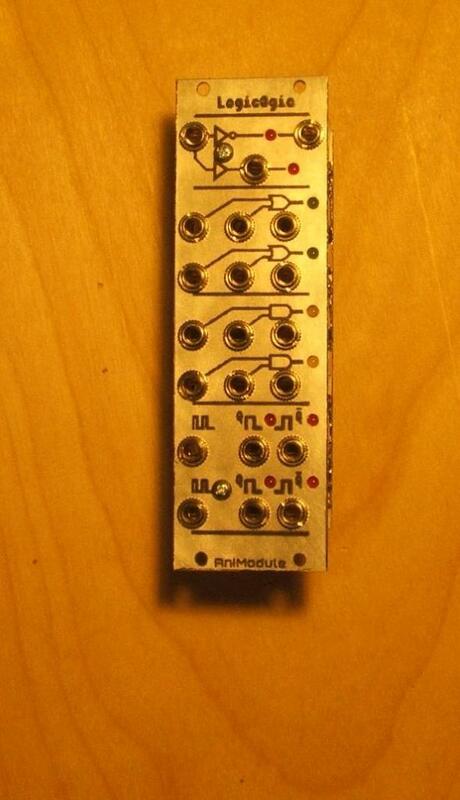 I have a line of MU modules and a small but growing line of eurorack modules (working on the site to get them posted). Each module is handmade with quality and love. I have a few DIY projects and PCBs and that number will be growing. My euro rack line has a new look of as of the past couple of days. I have screen printed front panels for the Quad Comparator and LogicOgic. I'll get photos up today. Here's a quickie of the Quad Comparator prototype. and I got the EuroRack Page on animodule.com up and running last week. I should have that together in the next few weeks. No need to get ahead, im just curious about what you up to. Hey cool you have a subforum now! I really like the way your modules are designed. The fact that you make your own panels and your own PCB's is very inspiring. The metal knobs are also a pleasure to turn and something the average user may take for granted. I know that they can't be cheap, and there are a lot of them on each module. I second this! These really look wonderful. Have you considered offering kits for the euro series? Yeah, I wanted it to be an experience. Nothing like touching the cool metal and feeling the weight of the knobs as you wiggle them. The knobs are expensive. I'd say well worth it though, for the look and the feel they have. It's high-end gear. Why scrimp on the subtleties? I make the eurorack stuff on my little desktop CNC mill. It's nice cause it's not a huge gamble every time I release a new module. I don't have to tie up $10,000 and hold my breath. It's not a lot of overhead. I have it set up in my kitchen and all I need is the raw materials. If one of my modules takes off and there's a high demand for it I can source it out with capital I make from the first run I cut on my mill. Also I don't have to cross my fingers when I send it out to get fabbed. If a mount hole is a millimeter off, I can change it and re cut it that day. All I lose is my time and the panel material. @ decaying sine - Thanks! I offer the PCBs for the Quad Comparator and LogicOgic modules. The VCSS and the SOB (that I'll be releasing shortly in eurorack) are more complicated boards and I'm using a fair amount of SMD stuff on them. I don't think they're great for the DIY'er. The LogicOgic even has a few 1206 resistors + caps. That one should be pretty manageable though. The Front panels are too time consuming and fiddly to offer for DIY at any sort of reasonable price. Once I sell enough to get some capital up I'll probably source them out and reconfigure, but right now I can't afford to do that. I'd like to offer kits, but I think right now my time is better spent developing/building modules. I'd need to be able to pay someone to kit them out and at least break even on it. Right now it's a scramble just to keep food in my belly and a roof over my head. extremely pleased with animodule's quad comparator here! the bipolar thresholds, gate + trigger outs, and the normalization of ch1 to chs 2-4 make this a "perfect module" in my opinion. i want another one! I've been meaning to send you an email to ask how it worked out for you. I'm glad it's what you were looking for! damn that logic is really nice. I have two of your modules, a ShNoiZe and a TikTok, with an SOB on its way as I write this. It's uncanny how quickly your stuff reaches the UK - often quicker than local outlets. 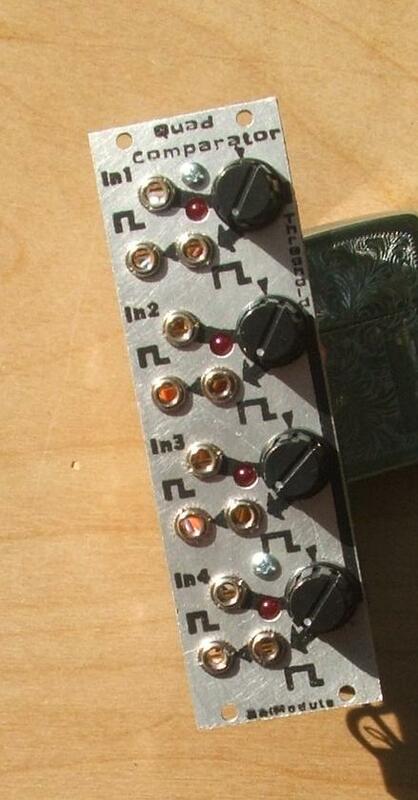 And, for their size, you squeeze a huge amount of functionality into your modules. That's so nice of you to take the time and post that! Quick question, I've just received my tiktok today but the red cross on the back has thrown me.... Which side does the red stripe on my power cable go on? Blank side or cross side? If you are looking at the rear of the module the Negative side is to the left. You can double check by looking which side the Negative Stripe on the Power conditioning capacitors point to. The TikTok does have reverse power protection, but it's still not good for your system to hook it up backwards.